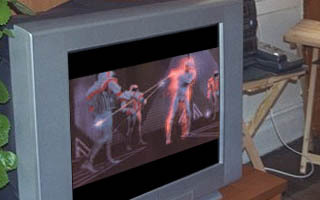 The flickering light of the television reflected off of Andrew's and Jeff's faces as they watched Tron on television, their feet propped up on a coffee table that had Dungeons & Dragons books and dice scattered about. "I'm glad you decided to stay," Andrew said before taking a drink of his soda pop. "I've, uh, I haven't had friends who are like, you know, normal and not evil masterminds." Jeff gave a slight grin. "Who knows? Maybe I'm a mastermind in training – dark force rising and all that." "Nah," Andrew answered. "You're not quiet enough. It's the quiet ones ya gotta look out for I've heard…so if you don't mind me asking what did it?" "What made you decide to stay?" Andrew continued. "You did actually," Jeff answered making Andrew smile. "And Willow. I got what she was saying about Bonnie's role in my mom's death. It's not all that different from you and Warren I guess. And Willow was big enough to put her personal feelings aside to let you into the circle. I don't see Bonnie and I baking cookies together or anything but…if Willow could do it with you then I guess I could survive with Bonnie. Maybe she's got some great qualities too that I'm just not willing to see right now." "That's very grown-up of you Jeff," Andrew commended. "This from a man who had an NPC kill Xander's Amazon warrior earlier tonight?" Jeff said trying to change the subject. "He spent a lot of time working up her attributes," he added as he haphazardly tossed some popcorn in his mouth. "Hey, it's not my fault he fell for the evil mage disguised as a harem girl. Did I force his Amazon warrior to drop her shield and sword? No," Andrew replied as he reached for some popcorn, his eyes still glued to the television set. "Yeah, but still…you waited to kill him until his character stripped off all of her clothing and allowed herself to be tied to the bed. That was harsh," Jeff said with mirth in his voice. Andrew smiled mischievously. "Well, I had to get his character's ogre-strength gauntlets off somehow, didn't I?" Both Andrew and Jeff broke out in a fit of laughter. "I didn't realize Tron was so funny," Dawn said apprehensively as she entered the room, looking back and forth between the television set and the giggling figures on the couch. "It's not," Jeff said between laughter-filled breaths. "We were just reliving some of the finer moments of tonight's D&D game." Dawn rolled her eyes. "Boys," she muttered under her breath. "Sshh," Andrew said suddenly with a wave of his hand in Dawn's direction. "I love this part." Dawn turned around to look at the television. On screen, Jeff Bridges was hurling a glowing sphere at an opponent in a geometric computer arena. Dawn turned back to Andrew, who had a look of child-like wonder on his face." "You do know that movie special effects have come a long way since then, right?" Dawn asked with a smirk. "Dawnie, nothing is cooler than Tron." Andrew replied in a condescending tone. "Um, Andrew, what about Star Wars?" Jeff piped in. Andrew looked crossly at Jeff. "You are not helping." Andrew turned back around to Dawn. "See, the cool thing about Tron is that the programmer got to actually be in the world that he created. He didn't just design the game, he was the game," Andrew said, his voice rising toward the end of his sentence. Dawn's eyebrows both rose to her hairline. "Riiiiiight. Okay, I'll just be going back to bed now…"
"Wait!" Andrew said suddenly, his eyes tracking back and forth between the television and the Dungeons & Dragons paraphernalia on the table. "What?" Jeff and Dawn asked in unison. Jeff and Dawn both looked at each other and smiled. "How cool would it be if we could actually play D&D, I mean, I wouldn't just be controlling an evil mage seducing Xander in the guise of Princess Leia from Return of the Jedi, I would be that evil mage!" Andrew said with a burst of enthusiasm. Dawn giggled. "Andrew, is there something about your secret fantasy life that we ought to know?" Jeff looked at Dawn and they both laughed. "Oh, ha ha, very funny. I just meant that it would be cool to actually be in the game, not just a dungeonmaster, but a participant," Andrew said as he crossed his arms and pouted. Jeff tried to stifle his laugh. "Yeah, sure, that would be pretty neat," Jeff said as he clapped his friend on the shoulder. "Except if some naked Amazon with ogre-strength gauntlets smashed you while you were the game. It would be hard to un-smash you in real life." "Yeah, maybe you should set your sights lower, Andy, like enchanting a Trivial Pursuit board, then the worst thing you'd have to deal with is ending up a little colored wedgie," Dawn added teasingly. Andrew stood up abruptly and looked at Dawn angrily, before his face softened. "Dawnie – you're a genius!" Andrew said as he went up to Dawn, kissed her forcefully on the cheek and then strode past her purposefully. "Um, ok," Dawn said with a confused look as she turned around to see Andrew fixated on the chessboard. "Andrew, I wasn't serious." Andrew studied the chessboard thoughtfully. "Simple game. Simple rules. No smashing. Boundaries to the board. It's a perfect test case." Dawn raised her hand. "Hello? How do you think you can do this?" Jeff looked fondly at Dawn for a moment, then turned his attention to Andrew. "She does have a good point." The corner of Dawn's lips edged upwards at Jeff's compliment. Andrew's lips formed into a frown as he crossed his arms and turned to look at the television. Suddenly, his eyes widened and he snapped his fingers. "That's it…we don't have the player be an actual participant, but more like the Master Control Program in Tron…a remote commander. You can still be part of the action, but be far enough away from the smashing. Whaddya think?" Dawn gave Andrew a dubious look and Jeff cast his eyes down in thought. After a moment, Jeff looked up at Andrew. "Well…maybe a subconscious spell would work…like a dream…you're there, but in no danger. You're just an observer," Jeff suggested. "Cool!" Andrew said with glee. "For once, research mode might be fun! Whaddya say, Dawn?" "I don't know. Sounds like a lot of trouble for a stupid game. And if Willow found out…" Dawn hedged. "She won't and chess is not stupid, Dawn," Andrew said with hurt in his voice. "Besides, the spell would work better with three. Please," Andrew whined. "What spell?" Skye asked as she entered and room and put her chin on Dawn's shoulder. "Hey you," Dawn said as she leaned back against her girlfriend affectionately. "You went a-missing. You know I can't sleep if you don't…" Skye lowered her voice and whispered the rest into Dawn's ear. Jeff and Andrew traded an uncomfortable look. Andrew coughed, "Um…spell…yes. Dawn was going to help Jeff and me turn this chess board into a fully interactive experience." "You were?" Skye asked Dawn as she raised both her eyebrows. Dawn smiled and shot Jeff a quick look, which did not go unnoticed by Skye. "Well, maybe," Dawn began. "I mean, I would probably like chess if it were a bit more interactive, and there doesn't seem to be any harm in trying to make chess more fun." In a softer voice she muttered, "If Willow doesn't find out." "She won't unless someone squeals," Jeff added. "And if worse comes to worst, the chess pieces go homicidal on each other and we buy a new, non-magic-y board before she notices." Skye looked at Jeff and wrapped her arm around Dawn's midsection. "Well, if the spell would work better with three, then four should be super, right?" Jeff and Andrew looked at each other and shrugged. Andrew walked over to the chessboard and began stuffing the pieces into his pants pockets and handing a few that didn't fit to Jeff. "Okay, but let's keep this quiet for now. 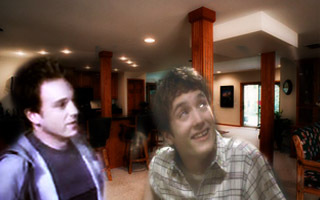 If this doesn't work out, I don't want Willow and Giles getting all persnickety," Andrew said with an air of authority. "Fine with me," Skye retorted. "Willow's been 'Ms. Self Involved Let's Not Let Anyone Else Have Fun Either' lately, anyway. Plus, I've been in the coven for over two months and I can't so much as float a pencil. I'd like to make something work." Andrew nodded and picked up the chessboard. "I think we should head over to the library now." Skye turned to look at Dawn with a pout, "You know, ever since hooking up with you, I've been hanging out a lot with sci-fi geeks with bulges in their pants. What's up with that?" Dawn intertwined her fingers with Skye's and began to follow Andrew, towing Skye along with her. "You know those sci-fi guys. They like to watch," she added with a laugh. Jeff took once last glance at the television, where two light cycles raced against each other, each trying to box the other in. He looked at the door where his friends just left and chewed on his bottom lip. Pressing the power button on the remote, he tossed it to the couch and followed his friends with a heavy sigh making sure to turn the light out as he left. From a parked car across the street, a woman sat and watched the light go out in the rec room. She looked at her watch and jotted something down on what looked like a clipboard. Putting it aside she turned the ignition and put the car in drive and started pulling away.